Across the snow-covered valley floor from the Lamar Buffalo Ranch, 06, the famous alpha wolf, and her Lamar Canyon pack encircle a bull elk. He has backed against a large, uprooted stump and has his front hooves in a shallow braid of Rose Creek. He is six-feet tall at the shoulder with 6 X 6 antlers and has several ways to kill a careless wolf. From where we wolf watchers stand, the elk and wolves are less than a half-mile away, visible with the naked eye, and amazingly detailed through the spotting scope. The air buzzes with excited chatter about how this life-or-death drama may unfold; wolves succeed in only one of every five attempts. The Lamar's last confirmed kill was three days ago. They must be famished; they have been gnawing on bones at old kill sites. Feasting on this elk who could weigh 700 pounds is crucial-but not guaranteed. This bull could be a good choice of prey by 06 for two reasons. First, a big elk means more meat for every member of her pack. Second, this bull is probably exhausted after last fall's rut during which he may have collected a large harem, slept little, expended lots of energy, and not grazed enough to completely recharge. Now, after several months of below-freezing temperatures, deep snow, and poor grazing, he could be even more depleted, more vulnerable. 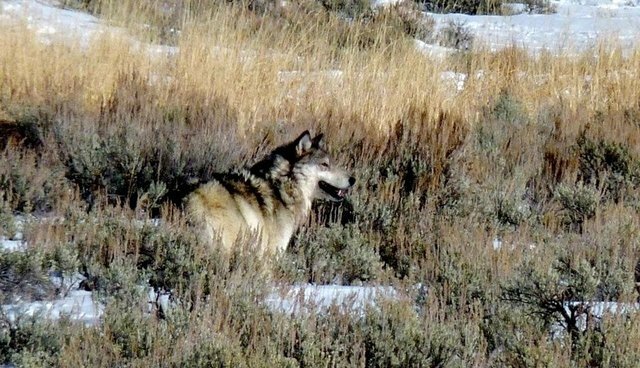 Rick Lamplugh lives near Yellowstone's north gate and is the author of the Amazon Bestseller In the Temple of Wolves: A Winter's Immersion in Wild Yellowstone. Available as eBook or paperback. Or as a signed copy from Rick.